Now called the Tap Tavern, this place is tucked away from the main street Richmond. I was the only customer in during my lunchtime visit. 2 ales were on - Twickenham Naked Ladies & Roosters The Wanderer. There are far more craft beers. I opted for the Siren Sweet Dream, which was £3.20 for a half. There were other craft beers from Siren, Wiper & True, Anspach & Hobday, Twickenham, Steam Machine, Siphon, South Lakes, Big Smoke, Salopian, Wild Weather & Roosters. Not sure I'll be back due to the excessive prices. A great little pub that always seems to have something going on. 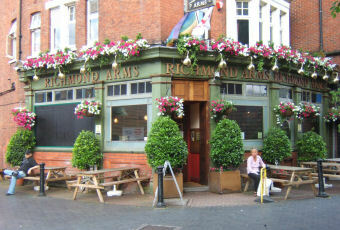 Prices are actually fairly cheap by Richmond standards and they have regular cheap drinks promotions. Great place to go at the weekend, open late with regular entertainment/DJ. It's a gay bar with a friendly attitude towoards everyone and pulls a mixed crowd in terms of male/female, gay/straight, and everything of all ages inbetween. Stumbled across this pub on a night out in richmond...was the latest open pub in the town which is always a plus. The staff were very friendly as were the customers. 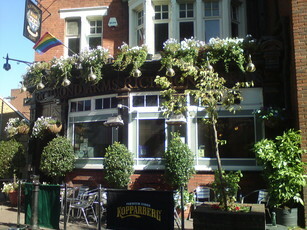 A very nice Gay bar on the back streets by Waitrose. Has lots going on Poker on Tuesdays, Karaoke Thursdays and a DJ on Fridays and is the latest bar open on the weekends. They are also bringing back more drag acts and have Drag Bingo on the last Sunday of every month. They have lots of great drinks deals such as 2 cocktails for £6.95, house bottle of wine for £10.50. They have also just started Super Savers which is on every day between 7pm and 9pm and ALL day Sunday, in this you can get a pint of Carling for £2.55 or a bottle of wine for £8.75 plus so much more. They have one ale on which at the moment is Reverent James which is a really nice pint and is kept well, they have a Cask Marque to prove it.